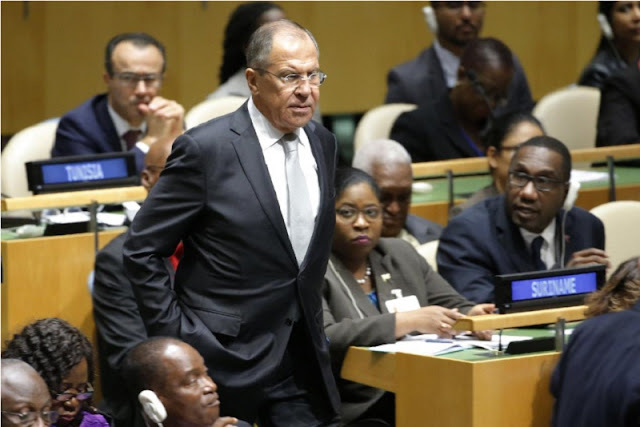 Russian Foreign Minister Sergey Lavrov arrives at the 72nd United Nations General Assembly at U.N. Headquarters in New York, U.S., September 19, 2017. MOSCOW - Russia is “extremely concerned” by U.S. President Donald Trump’s comments questioning the Iran nuclear deal and suspects that Washington itself may have violated a landmark arms control treaty, Foreign Minister Sergei Lavrov said. Lavrov’s comments, made to Russian reporters at the United Nations in New York and published by his ministry on Wednesday, illustrate how deeply Moscow and Washington are at odds over an array of issues and suggest any attempts to improve already battered relations face an uphill struggle. Addressing the United Nations General Assembly on Tuesday, Trump said Iran’s 2015 pact with six world powers to curb its nuclear program in return for loosening economic sanctions was “an embarrassment to the United States”. Washington could not abide by an agreement “if it provides cover for the eventual construction of a nuclear program,” Trump said. Lavrov, whose country is a signatory to the deal, said Russia strongly disagreed with that stance. Trump’s threat in the same U.N. appearance to “totally destroy” North Korea if it had to defend itself or it allies also went down badly with Russia, which shares a border with North Korea and believes negotiations and diplomacy are the only way to resolve a crisis over Pyongyang’s missile program. “If you simply condemn and threaten, then we’re going to antagonize countries over whom we want to exert influence,” said Lavrov, referring to Trump’s comments. He saved some of his harshest criticism however for what he said was a possible violation by the United States of a landmark 1987 arms control treaty which bans Russian and American intermediate-range missiles on land. A senior Trump administration official accused Russia earlier this year of violating the same pact -- the Intermediate-range Nuclear Forces (INF) treaty -- something Moscow denied. But Lavrov said it looked like it was Washington, which is in the midst of a $1 trillion, 30-year modernization of its aging ballistic missile submarines, bombers and land-based missiles, that was in breach of the same treaty. “We have suspicions on at least three fronts that the Americans are creating weapons systems which violate or could violate the treaty obligations,” said Lavrov, who said Moscow had relayed its concerns to the United States. Lavrov has met U.S. Secretary of State Rex Tillerson twice in New York this week. Russia is “extremely concerned” by U.S. President Donald Trump’s comments questioning the Iran nuclear deal and suspects that Washington itself may have violated a landmark arms control treaty, Foreign Minister Sergei Lavrov said.